Does The Vatican II Lectionary Distort Scripture? HOMAS JEFFERSON (d. 1826) published a special edition of the New Testament which removed any mention of Christ performing miracles because these were deemed unsuitable to “modern man,” who can solve all problems with science … unlike the foolish people of the Middle Ages. Brothers and sisters: Live in love, as Christ loved us and handed himself over for us. Husbands, love your wives, even as Christ loved the Church and handed himself over for her to sanctify her, cleansing her by the bath of water with the word, that he might present to himself the Church in splendor, without spot or wrinkle or any such thing, that she might be holy and without blemish. So also husbands should love their wives as their own bodies. He who loves his wife loves himself. For no one hates his own flesh but rather nourishes and cherishes it, even as Christ does the Church, because we are members of his Body. For this reason a man shall leave his father and his mother and be joined to his wife, and the two shall become one flesh. This is a great mystery, but I speak in reference to Christ and the Church. Could this be caused by the USCCB changing the official Mass texts? No, you can see that the official Ordo Cantus Missae specifically allows the “difficult” verses to be omitted. Most people won’t notice which verses were excluded, because the layout makes them hard to detect. Jesus again in reply spoke to the chief priests and elders of the people in parables, saying, “The kingdom of heaven may be likened to a king who gave a wedding feast for his son. 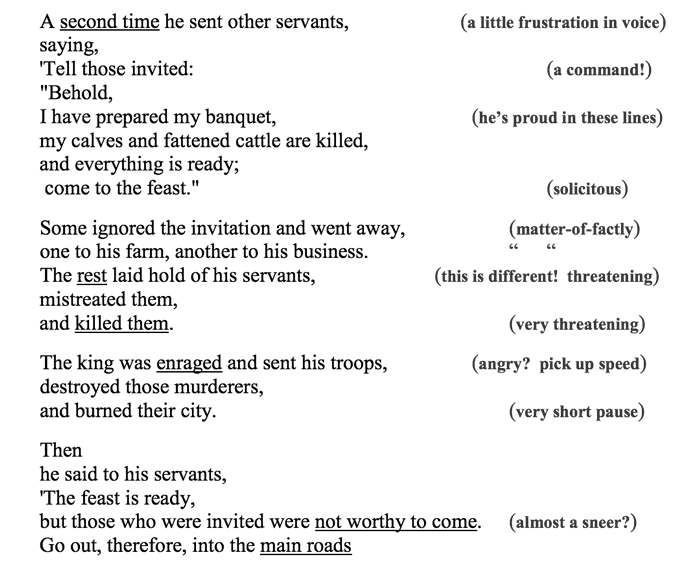 He dispatched his servants to summon the invited guests to the feast, but they refused to come. A second time he sent other servants saying, ‘Tell those invited: “Behold, I have prepared my banquet, my calves and fattened cattle are killed, and everything is ready; come to the feast.”’ Some ignored the invitation and went away, one to his farm, another to his business. The rest laid hold of his servants, mistreated them. The king was enraged and sent his troops, destroyed those murderers, and burned their city. Then he said to his servants, ‘The feast is ready, but those who were invited were not worthy to come. Go out, therefore, into the main roads and invite to the feast whomever you find.’ The servants went out into the streets and gathered all they found, bad and good alike, and the hall was filled with guests. The “Shorter Form” of the Parable of the Wedding Garment remarkably leaves out the wedding garment. It is like dropping the last chapter of an Agatha Christie novel. I cannot imagine how any congregation would be so rushed that it could not find time for the thirty seconds it takes to read that warning about coming to the nuptial feast of the Eucharist unclothed in baptismal virtue, without sins confessed. If that is not suitable for the general audience, there is something wrong with the general audience. As a reminder, the Council fathers voted on the principles of reform, but left the reform itself in the hands of Pope Paul VI. Fr. Hanshell has commented, “Not all that has happened to the liturgy since the constitution was produced by the Vatican Council is in accordance with that document.” Many agree, and continue to call for a careful evaluation of how well the post-Conciliar reforms were implemented. UPDATE: Many other examples supporting Fr. Rutler’s assertions could be considered. Two that spring immediately to mind are the Gospel readings for the 33rd Sunday in Ordinary Time (Year A) and the 32nd Sunday in Ordinary Time (Year C), but there are many more examples. The “shortened” readings are not the only ones to avoid “difficult” passages; for example, consider the 1st Reading for the 33rd Sunday in Ordinary Time (Year A). See also numbers 75-77 in the Introduction to the Lectionary.